The SPACE, a resident-led hub in Notting Dale will be hosting the community to an afternoon of entertainment, food, fun and health checks this Saturday. 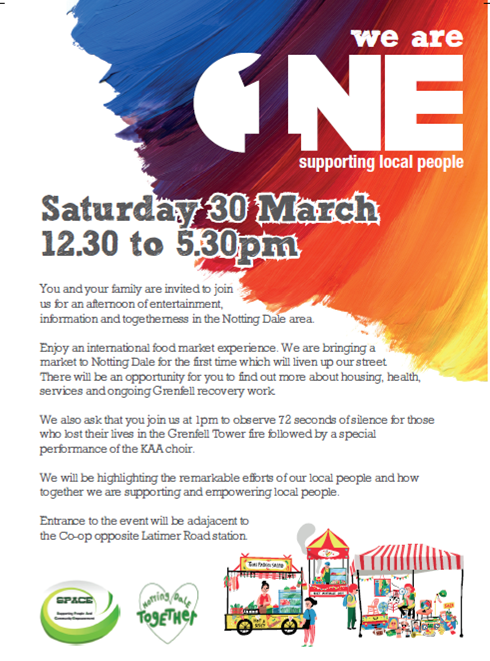 The ‘We are One’ event promises to bring an ‘international food market’ to the streets of Notting Dale, where residents can also get enhanced health checks with the NHS from 12:30pm to 5pm. There’ll be opportunities to find out more about health services and ongoing Grenfell recovery work. Residents will also be able to try out virtual reality and see celebrity footballer Les Ferdinand in VR. There’ll be children’s shows, international food stalls, graffiti workshops, smoothie bikes, massage therapy and much more. The event will observe 72 seconds of silence for those affected by Grenfell. The entrance to the event will be opposite Latimer Road station. Save the date – it’s Saturday 30 March 12:30pm to 5:30pm. You can read or download the poster and programme here or by clicking on the image below.